Today is the day! 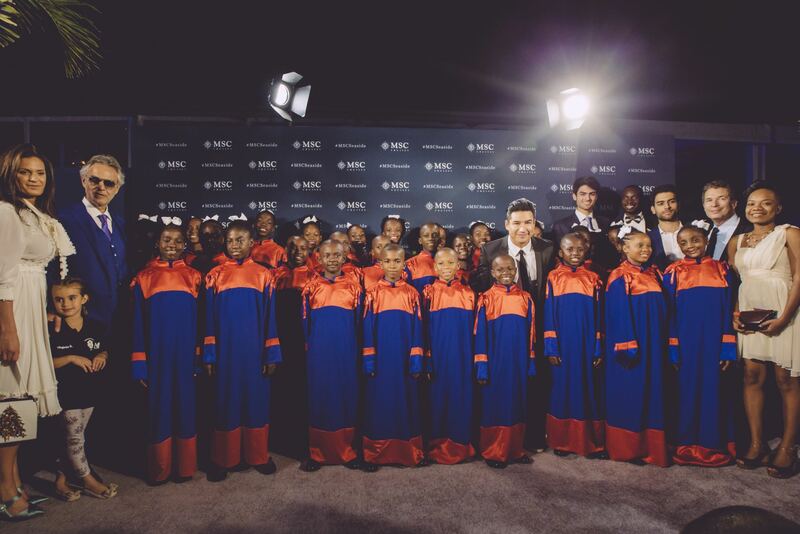 With choir robes ready in their backpacks and their fresh enthusiasm the “Voices of Haiti” choir reached the Port of Miami at 9am for the rehearsal of the concert. The choir alongside Maestro Bocelli have been invited to perform at the naming ceremony of the MSC Seaside ship, that will be operating a cruise around the Carribian islands starting on December 23rd. The stage will also be graced by Ricky Martin, Dan Marino, and Sophia Loren. The young singers had the opportunity to explore the ship, walking through the many decks and reaching the kids area where they cut the inaugural ribbon together with ABF Vice-Chair Veronica Berti. But their best smiles came out while running and playing on the green expanses of South Pointe Park in Miami Beach during their time off of the stage before the performance. Make up, hair, dressing up, at 6.00pm they are ready to approach the red carpet with Maestro Bocelli and the family. The guests of the event welcome the choir on the carpet with a sonorous applause, and when they walk the stage in their blue and red colours a silence come down in respectful expenctancy. It is under the Miami sky that the choir fill in the night with their vibrant voices. When the choir and Maestro Bocelli reach the final notes of Amazing Grace, all of the guests are in a collective standing ovation! The message is unique for all those present: ”Bravo”! And in this incredible atmosphere MSC CEO Pierfrancesco Vago announced a new partnership with the ABF to support and promote the Educational projects of the Foundation in Haiti, with particular attention to healthcare provided by the Mobile Clinic project. It’s almost the end of the show, it is almost a new beginning of a “friendship” that aims to bring hope to Haiti!